InterSystems IRIS also provides specialized business service classes that use SOAP, and one of those might be suitable for your needs. If so, no programming would be needed. See “Connectivity Options” in Introducing Interoperability Productions. A proxy client class that defines a proxy method for each method defined by the web service. Each proxy method uses the same signature used by the corresponding web service method and invokes that method when requested. 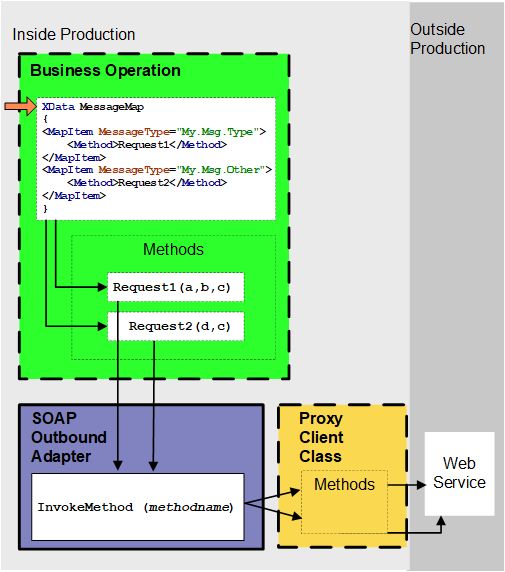 A business operation that uses the InterSystems IRIS Interoperability SOAP outbound adapter to invoke the proxy client. Supporting classes as needed to define XML types and production messages. The following figure shows how the business operation, adapter, and proxy client class work together. Supporting classes are not shown here. In the preceding figure, all items within dashed lines can be generated by the SOAP client wizard in Studio. You can then edit this code as needed. For a more detailed look at these parts, see “InterSystems IRIS Support for Web Clients,” earlier in this book. This section outlines the basic steps to create an InterSystems IRIS Interoperability web client. Use the SOAP wizard to generate the business operation class, proxy client class, and supporting classes. This tool is described in “Using the SOAP Wizard” in this chapter. Check whether you need to adjust the types of the inputs and outputs of the methods. In Studio, make sure that you are in the appropriate namespace. Click Tools > Add-ins > SOAP Wizard. On the first screen, enter the entire URL of the WSDL document for the web service you want to work with. Select the check box to the left of Create Business Operation in Package. This option instructs the wizard to define a business operation class that invokes the proxy client, as well as message classes for use with that business operation. For Create Business Operation in Package, optionally change the subpackage name from BusOp to another name. For Class Type, choose a general type for the proxy client class: persistent or serial (the default). Click Next. The wizard generates and compiles the classes and displays a list of these classes. The SOAP wizard generates a set of classes; the details of these classes are discussed later in this chapter. You specify the package in which the tool should create the proxy client class and the supporting classes. If this package is the same as an existing package, by default the tool will overwrite any existing classes that have the same name. To prevent the wizard from overwriting a class definition, add the XMLKEEPCLASS parameter to that class and set this parameter equal to 1. Create an instance of %SOAP.WSDL.Reader. Optionally set properties to control the behavior of your instance. CompileFlags Specifies the flags to use when compiling the generated classes. The initial expression is "dk"; use $System.OBJ.ShowFlags() to get information on the available flags. MakePersistent If this property is 1, the proxy client is a persistent object; otherwise, it is a registered object. The initial expression is 0. MakeSerial If this property is 1 and if MakePersistent is 1, the proxy client is a serial class. The initial expression is 0. OutputTypeAttribute Controls how the WSDL reader sets the OUTPUTTYPEATTRIBUTE parameter in the proxy client that it generates; which controls the use of the xsi:type attribute in the SOAP messages. See Creating Web Services and Web Clients in the documentation set. MakeBusinessOperation Specifies whether to generate a business operation and related request and response objects. The ADAPTER setting for this business operation is EnsLib.SOAP.OutboundAdapter. This option works only if you are working within an interoperability-enabled namespace. For other properties, see the class documentation for %SOAP.WSDL.Reader. The first argument must be the URL of the WSDL of the web service or the name of the WSDL file (including its complete path). Depending on the configuration of the web service, it may be necessary to append a string that provides a suitable username and password; see the examples. The optional second argument is the name of the package in which the reader should place the generated classes. If you do not specify a package, InterSystems IRIS uses the service name as the package name. This section provides information about the classes that the SOAP wizard generates. It defines a web method named AddService, which accepts two complex numbers as arguments and returns the result. It generates the MyClient.BusOp.MyServiceSoap class, which defines the business operation. /// This is the URL used to access the web service. /// Use xsi:type attribute for literal types. Finally, it generates the MyClient.ComplexNumber class, which defines a complex number and which is used by the other classes. When you compile these classes, the compiler also generates a class for each method defined in the web service. These classes are not automatically added to your project and their internal details are subject to change. These classes extend %SOAP.ProxyDescriptor, which you should never subclass yourself. In your class, the ADAPTER parameter should equal EnsLib.SOAP.OutboundAdapter. Your class should define one method for each method of the proxy client, as described in the following section. You will also need to define the production message classes that the business operation uses. The method should have the same signature as the proxy method that it is invoking. The method should be marked with the WebMethod keyword. The method should set the WebServiceClientClass property of the adapter. When this property is set, a proxy client instance is created and placed in the %Client property of the adapter. The method should call the corresponding proxy method, using one of the techniques in the next section. The method should check the status. In the case of success, create a new response message (via the NewResponse() method of the request) and set its properties as appropriate. In the case of failure, quit with the error. Within your business operation, your methods should execute the proxy methods of the proxy client class. You can do this in multiple ways, which are best shown via an example. This section uses an example web service that has a web method named GetStock that accepts a stock symbol (a string) and returns a number. Suppose that you have used the SOAP wizard to generate a proxy client (GetStock.StockServiceSoap), which contains a method called GetStock. When you use the SOAP wizard to generate the business operation, it uses this method. Note that with this technique, you do not have access to the retry logic of InterSystems IRIS. In this case, you can provide any number of arguments. This section provides reference information for the adapter property and methods mentioned in the previous section. The associated instance of the proxy client (an instance of %SOAP.WebClient). This property is set when you set the WebServiceClientClass property of the adapter. Calls the specified method of the proxy client class, passing all the arguments and returns the status. The output is returned by reference as the second argument. Returns an object that corresponds to the specified method. This object has one property corresponding to each method argument; you should set this properties before using the Invoke() method. For details on %SOAP.ProxyDescriptor, see the class reference. Calls the given method and returns the status. Add an instance of your custom business operation class to the production, specifically the business operation class generated by the SOAP wizard. Specify appropriate values for the runtime settings of the associated adapter, as discussed below. For settings not listed in this book, see “Settings in All Productions” in Managing Productions Productions. You can use WS-Security user authentication. In this case, you include a WS-Security header in the SOAP request; this header includes the username and password. The proxy client automatically does this if you specify a value for the SOAP Credentials setting. Ensure that you are using SSL between the web client and the web service. The WS-Security header is sent in clear text, so this technique is not secure unless SSL is used. You can use basic HTTP user authentication, which is less secure than WS-Security but is sometimes required. In this case, you include the username and password in the HTTP header of the SOAP request. The proxy client automatically does this if you specify a value for the Credentials setting. Use the technique that is appropriate for the web service you are using. If the web server supports it, you can connect with SSL. To do so, specify a value for the SSL Configuration setting. You must also ensure the web service is at a URL that uses https://. The web service location is determined by the Web Service URL setting; if this is not specified, the InterSystems IRIS Interoperability web client assumes the web service is at the URL specified by the LOCATION parameter in the proxy client class. You can communicate with the web service via a proxy server. To set this up, use Proxy Server and other settings in the Proxy Settings group.